We’re about to find out who earns automatic bids to the 2017 NCAA Division III Cross Country Championships, which will be held November 18 in Elsah, Illinois. That’s because this weekend is packed to the brim with Regional Championships. Remember: The top-2 teams in each region automatically qualify for NCAAs. The remaining teams must rely on at-large points. If you scroll through this post, you’ll see we listed every team in the most recent National Coaches’ Polls by region. We ranked the meets in order of importance to the next National Coaches’ Poll and added a note for historical context at the bottom. 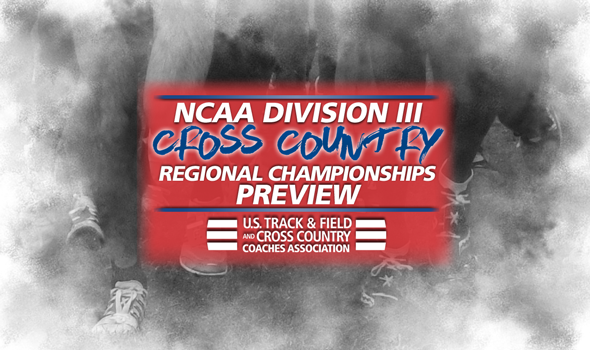 Note: Amherst’s men are looking for their first regional title since 2007, while MIT’s women could make it three titles in the past four years. Note: Since 2008, North Central (Ill.) has won all but one of the regional titles. If Wheaton (Ill.)’s women capture the crown, it would be quite the rise for them as they finished 15th in 2016 and 11th in 2015. Note: SUNY Geneseo swept the past two regional meets. Note: Three different men’s programs have won the team title over the past three years (Johns Hopkins, Haverford and Carnegie Mellon), while the Johns Hopkins women won the last nine in a row. Note: Loras ended St. Olaf’s four-meet win streak last year and can create a back-to-back opportunity of its own. No women’s team has repeated as champion since Wartburg in 2012 and 2013. Note: Calvin has won nine of the past 12 men’s titles. Hope’s women enter the top-ranked team and last won in 2015. Note: Claremont-Mudd-Scripps has won the last three men’s titles, so that streak could be in jeopardy if the rankings hold true. The CMS women haven’t won a team title since 2013. Note: Christopher Newport’s men can make it two in a row with a victory here. Trinity (Texas)’s women last won in 2013, which is right before Emory started a three-meet win streak.